MC Firstly, Iain, are you fully recovered from your crash at the British National Championships? ID Pretty Much. I have the odd slight niggle still, but nothing major. We were lucky to come out of it with just minor injuries and I was back into training within a couple of days. Luke had some nasty road rash, but managed to race the next day and take 2nd place in the student championships! MC It’s not your first big incident in the last couple of years is it? Did you feel that it was happening to you all over again? ID I crashed heavily on the bike leg at the World Triathlon Championships last year in Beijing when racing with Liam Gentry. We came out of the water about one minute down on a new Brazilian pairing who looked good. We were comfortably in second place and arguably could have played it safe, but as I was defending champion there was no way we were going to settle for silver without a fight. Once on the bike we pushed really hard, especially up a long climb early on. We descended rapidly and almost certainly would have caught the leaders…A tight left hand corner was our undoing as we careered off the road at about 45MPH into a deep concrete drainage ditch. With the tandem badly damaged and Liam and I injured, our race was over. Liam was devastated as he felt responsible, but these things happen sometimes when racing at that level. The crash at the Nationals was quite different in the sense that it occurred not because we were pushing the limits, but due to something totally out of our control. Luke Watson was guiding for this race and all seemed to be going well as we led out the swim. Onto the bike and we were pushing on to build a lead before the run when out of the blue I heard Luke shouting at someone or something. Sitting on the back of the tandem I didn’t know what was happening, but then I heard a woman’s panicked voice and I sort of knew instantly it was a child on the circuit. Fractions of a second later we collided with the child, who had apparently cycled out in front of us and froze as we approached at speed. There was nothing Luke could do. Thankfully we all only had a few cuts and bruises, although I will never know how …… it could have been much, much worse. I couldn’t believe I had crashed again. I had an awful 2011 season with injuries, mechanical problems and that crash in China, but after winning the European championships in April I felt my luck was changing. I was also pretty gutted to wreck the new tandem and wheels Matrix had generously supplied for this season. MC The threat of serious injury as a visually impaired cyclist must play heavily on the mind. Whatever made you take up triathlon, where there is so much emphasis on the bike leg, rather than sticking with swimming for instance or running? ID I try not to worry about crashes and injuries as they are usually quite rare (honestly!). Prior to the last two incidents, I hadn’t crashed for over 10 years! I have been cycling since I was 15 and competed to a high level in that sport, but eventually needed a new challenge. Triathlon fitted the bill as it would give me a whole set of new goals to work towards. I had actually done a couple of events when I was younger, but I was spectacularly unsuccessful, mainly because I was an awful swimmer. In some ways, I wanted to go back and even the score after my early experiences in the sport! MC Training obviously takes up a huge part of your week. How do you fit the demands of being a world class athlete around a full time job and other aspects of a normal life? ID Its a tricky balancing act. I enjoy my work as a Physiotherapist and want to do as good a job as possible, but I also want to be as good at my sport as possible. The two things don't really go well together as working full-time just doesn't leave enough training and recovery time. Ultimately my wife, Jill, and I don't live a normal life as she puts in as much time and effort into this as I do. We don't get time for much else outside of work and triathlon, but try to have the odd break when we can. MC And you also found time to get involved with a University development project. ID Rio Tinto (who are providing the metal for all of the medals at the 2012 games) funded a project at Imperial College in London where the students were challenged to innovate equipment for use in Paralympic sport. The Ultimate aim was to develop something that would be used at or in preparation for the 2016 games or that would help people with disabilities lead a more active lifestyle. My role was just to provide some real world experience and the odd idea, which hopefully I did. One of the projects I had a hand in, the ‘Ghost’, won a £5,000 grant to develop the idea further. There were several other great ideas too, all put together in just three weeks from idea to prototype. MC You’ve just returned from a training camp in Loughborough. How was that? ID It was a very busy, but hugely productive four days. On the one hand I was trying to make the most of the facilities and expertise on offer through the British Triathlon coaches and support staff whilst also trying to spend some time with a potential new guide, Carl Shaw. This meant some days I did 5 sessions and had other 1:1 activities with the support team on top. Whilst I did quite a high volume of training, I also ended up doing a lot of high intensity work with 5 fitness tests in the first 2 days! It should help me move forwards for the rest of the season and hopefully beyond. MC So you’ve already won the European Championships with your guide Luke Watson this year, the nationals we know about but I guess it’s all eyes on the Worlds now? ID Definitely. It will be tough to win back the World title in New Zealand during October, but Luke and I are going to give it a good go! I have quite a few races before then too such as the Norwich Triathlon organised by my club Tri-Anglia, a Paratri in Scotland and the World Duathlon championships in France. MC Many people are under the misconception, aren’t they Iain, that your guide plays no other part than to steer you round the course. Can you explain the roll of a guide and the importance of finding the right one for you. ID It can work both ways as some people think that, whilst others think the guide does all the work and just drags me around! Neither is true. The guide needs to direct you as quickly and safely around the whole event as possible. 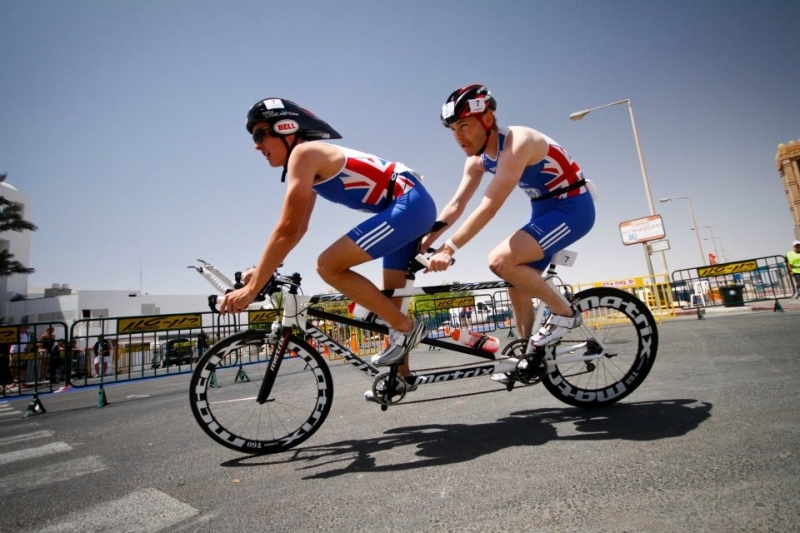 They swim tethered to their visually impaired partner, then pilot the tandem around the bike leg before running alongside the athlete who has to wear blacked-out glasses, giving directional instructions and other information as needed. They have a hard job! It’s a team effort and you have to work out how to get the most out of the pairing. You need to adapt your strategy to each other’s strengths and weaknesses as well as the type of race and the opposition you are facing. You need a guide who firstly isn’t going to slow you down, secondly is going to be strong on the bike and thirdly is quicker than you on the run so they still have the breath to talk. Ideally, you need someone who shares a goal with you and you need to get on well with other! MC We’re obviously delighted to see you winning at the highest level on the Matrix carbon tandem and wheels but do you think that the equipment you choose does make that much difference to your performance? ID At the end of the day, whatever you use you still have to push the pedals around and generate the power needed to be successful. However, having top quality equipment really does help at this level of sport. For example, the Matrix tandem is incredibly stiff so no power is lost through the frame flexing and this also helps with handling meaning you can corner a bit quicker too. It is very light for a tandem when combined with the T806 deep section carbon wheels making any uphill sections or accelerations easier. This combination helped us win the European title. I also have a J3 (tri-spoke) front and rear disk wheel that are great for flatter courses where aerodynamics are the most important factor, adding 1-2MPH for no extra effort depending on the conditions. MC And is carbon really a viable material for the forces and geometry of a tandem – I know a lot of people are sceptical? ID I have always been a bit sceptical myself when it comes to using carbon in tandem frames or forks. When I first saw the Matrix tandem on the internet I thought it looked amazing, but I was still unsure of how strong or durable it would be. Clearly carbon technology has moved on massively in recent years and there are several tandem manufacturers using this material now. Where the Matrix tandem differs to the others is that it uses aluminium tubes at the front, middle and rear of the bike mixed with carbon tubes for lightness. The aluminium sections increase stiffness but also seem to absorb any twisting/torsional forces and so should increase durability. So far, it’s been a revelation compared to other tandems I have ridden. MC Now I know that people find this hard to believe but you also compete in individual time trials and other events don’t you? ID Yes, I ride a few TT’s on local courses that I know well, one’s where I can recce the course thoroughly beforehand with Jill and then train on the same roads regularly beforehand. I have less than 10% sight so I have to be careful, but I am well adapted to this. I have to concentrate hard on what I am doing, although I have very quick reactions so rarely even hit a pot-hole. This is helped massively by riding a bike that handles superbly like my new Matrix Pyro TT, it rides more like a road bike which I like a lot. Although I’m competitive, I don’t take risks or ride in poor light when cycling by myself as it’s not worth it. I often have to back off significantly as my physical ability outstrips my visual ability. Its good training though and nice to do something independently, but I do my serious racing on the tandem! 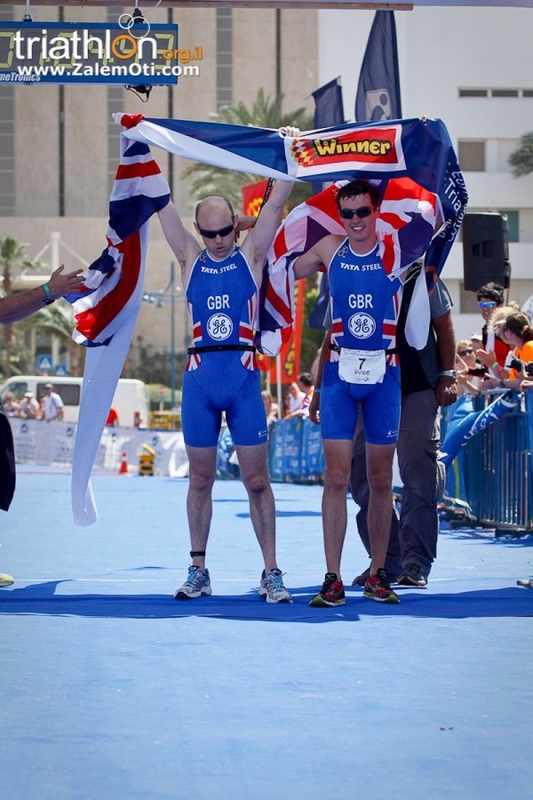 MC Where do you see paratriathlon as a sport in ten years from now in light of its inclusion in the 2016 Paralympic games? ID It’s developing quickly as a sport and that will continue exponentially over the next few years in the lead up to Rio 2016. After that, the growth and standards will continue to rise for the 2020 games and beyond. Maybe not me, but by the next Olympic cycle I would expect those involved will be full time triathletes. MC And will you be there competing? ID Rio, yes hopefully, after that I doubt it – I will be 45 in 10 years time …… I am sure I will still be doing something to keep active though as there are lots of challenges out there to be tackled! MC You’ve already had an illustrious career in your sport and no doubt you have many more accolades to come. Is there any sports person in particular, from the past or present, that you admire and feel has had an influence on you personally? ID Although total opposites, I always like both Chris Boardman and Graeme Obree: Boardman for his scientific, high-tech approach and Obree for his inventive approach and pure genius at times. MC And finally, Iain, what advice would you give to the club triathlete who wants to take the next step towards stardom? ID Aim high but set realistic intermediate goals to help you get where you want to be. Be patient: consistency over a long period is the key when training for improvement even if you are naturally gifted. 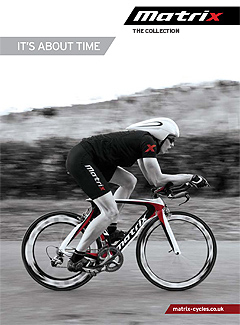 There are no short cuts to success, except buying a Matrix bike of course! MC Many thanks Iain and all the best for the future.